Most individuals try staying active as they get older, but not even exercise and healthy eating can prevent individuals from obtaining illnesses that hinder their ability to move, whether it’s debilitating arthritis or lung disease. Most people have a vested interest, emotionally and financially, in their house and feel that moving out of the home in which they have spent years making memories is not an acceptable option. Individuals in Cuyahoga Falls, Ohio, and all Northeast Ohio searching for alternatives to climbing stairs have options available to them when they contact Access Solutions in Akron, Ohio. They are dedicated to enhancing the lives of mobility-impaired people in Tallmadge, Ohio, and beyond by creating a barrier-free living environment. Whether a home requires a curved stairlift, a straight one, or one that is separated by a landing, this local stairlift company can accommodate most homeowners’ budgets. Access Solutions’ showroom allows consumers to evaluate and experience different makes and models of indoor and outdoor stairlifts. Not only can Access Solutions fill the needs of a wide range of circumstances, but they can also help people adjust to other circumstances with vertical lifts, incline lifts, ramps, elevators, and dumbwaiters. One call to their friendly and knowledgeable staff can help anyone gain more freedom and independence! People in Northeast Ohio love where they live, because they have expended energy and finances to remodel, redecorate, and fine-tune their living area to their personality and lifestyle. 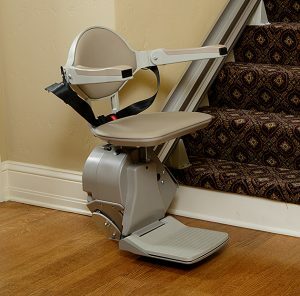 When it comes time to think about installing a stairlift as an alternative to climbing stairs, people are generally also trying to adjust mentally to their new normal, and the staff at Access Solutions in Akron has the courteous and compassionate nature with which to assist their clients obtain a barrier-free living environment. 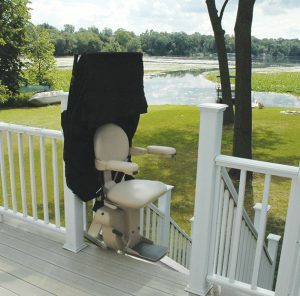 Whether someone lives in a ranch and requires an outdoor stairlift to go up porch steps, or another person lives in a two-story home and needs an indoor stairlift to get to their bedroom, this local stairlift company provides models to fit any budget. When someone wants to maintain their independence without structural changes to their home, a stairlift is a simple, safe, and dependable solution. Access Solutions is an authorized dealer of Bruno, Harmar, and Savaria brand stairlifts, from the popular Bruno Elan to Pinnacle Premium stairlifts. Bruno offers the Elan Indoor as a reliable, easy-to-use, affordable indoor straight stairlift, and the Elite Straight with a more luxurious chair, compact design, and plenty of power. The Elite curved stairlift melds into every curve, since it is built to the exact specifications of any staircase. They also offer outdoor Elite in straight and curved models. Harmar offers the affordable Vantage straight, which is smooth and consistent, as well as the more select Pinnacle model in a lightweight, compact design. Savaria offers the K2 stairlift for indoor straight stairs, which boasts the smallest fold up size on the market, as well as a customized curved stairlift option in the Stairfriend. Most stairlifts are battery-operated so that they will work during any power outage, and many of them possess standard features such as a wireless remote, automatic charger, and a swivel seat at the top landing. 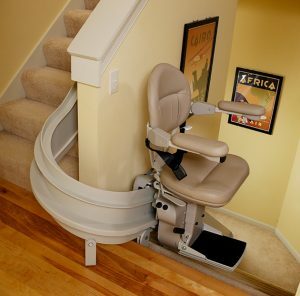 Not only does Access Solutions provide a vast array of stairlift solutions, but also addresses all mobility concerns with vertical lifts, incline lifts, and ramps. Anyone in Tallmadge, Cuyahoga Falls, and beyond can count on this local stairlift company for guidance in recapturing their freedom. It is very difficult for many people to transition from what they have considered a mobile life to a new normal in a less ambulatory reality. Whether someone has suffered an acute injury or is experiencing the progression of a chronic illness, Access Solutions in Akron, Ohio, can help guide them as they choose a means of regaining their independence. Not only can they provide vertical lifts, incline lifts, elevators, dumbwaiters, and ramps to anyone in Tallmadge, Ohio, but specialize in stairlifts for Cuyahoga Falls, Ohio, and all Northeast Ohio. While someone is researching an alternative to climbing stairs, they discover the versatility that this local stairlift company can supply with their affordable straight and curved indoor and outdoor stairlifts in varying levels. Access Solutions not only possesses over 50 years of knowledge with which to guide their clients toward the best product befitting of their goal toward achieving a barrier-free living environment, but also the compassion to assist someone through the an extremely difficult time in their life by helping them regain their freedom. This entry was posted in Handicap Modifications, Home Improvement and tagged Access Solutions Inc, alternative to climbing stairs Cuyahoga Falls Akron Tallmadge Northeast Ohio, barrier-free living environment Cuyahoga Falls Akron Tallmadge Northeast Ohio, curved stairlifts Cuyahoga Falls Akron Tallmadge Northeast Ohio, incline lifts Cuyahoga Falls Akron Tallmadge Northeast Ohio, indoor stairlifts Cuyahoga Falls Akron Tallmadge Northeast Ohio, local stairlift company Cuyahoga Falls Akron Tallmadge Northeast Ohio, outdoor stairlifts Cuyahoga Falls Akron Tallmadge Northeast Ohio, ramps Cuyahoga Falls Akron Tallmadge Northeast Ohio, stairlifts Cuyahoga Falls Akron Tallmadge Northeast Ohio, vertical lifts Cuyahoga Falls Akron Tallmadge Northeast Ohio by admin. Bookmark the permalink.